Jennifer Tanner has been involved in Lutheran Education since her first day of kindergarten at Zion Lutheran in Walburg, Texas. She graduated from Concordia University at Austin in 1999, and began her ministry as a middle school teacher in Lakeland, Florida. 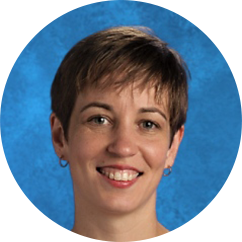 Coming to Grace in 2006, Jennifer Tanner served as 8th grade teacher until becoming principal in 2016. Together with the Pastors, Principal Tanner works to build strong relationships between our church and school community.